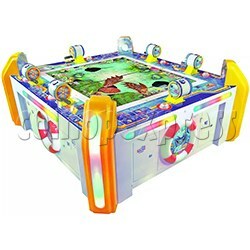 Deep Sea Story Fishing Arcade Machine (Fishing Reel version) is a 6 players fishing simulation game redemption machine by winding 6 unique fishing reels to control the game, with 3 different levels for playing in two 42 inch screens. The game is very exciting that the more various fishes you got, the more output tickets you won.It is a brand new fishing theme video arcade game which leading the new trend of family game. When the game starts, the game play comes with lots of fishes, then casts the float. Once the fish takes the bait, the graphic will enlarge and words will show on the screen to remind player for getting the fish; player can wind the unique fishing joystick to reel them in; or use one point to unleash a thunder bolt to give the fish an electric shock to weaken them, then keep winding the reel to catch them in. The thunder bolts are the trump card against the toughest fishes. The game is playing as it is a actual fishing and you will enjoy more fun from it. - land the fish to get points for related tickets.